The T.A.W.S. line of handguards provide a rigid mounting platform for lasers, high intensity lights, bipods, slings, forward grips, and ever night vision or sighting systems. The basic system starts with an aircraft aluminum tube, threaded to a replacement barrel nut. The 1/8” wall tube has been machined with a Swiss cheese hole pattern, to reduce weight and a series of slots to allow the flexible mounting of the lasers, lights and more. When these are installed on an AR’s upper, you have a totally free-floating barrel for maximum accuracy. A full-length Weaver rail can then be added. This provides a solid, one-piece sight mounting surface from the charging handle to the front of the handguard. Optics can be mounted in tandem with night vision; with fold down metallic sights, or most anything you can think of. True flexibility on a rigid platform. Machined from 1/8” wall 6061-T6 aluminum. A 3/8” slot is milled in the bottom on each tube, for mounting handstop, bipod or vertical grip. Mounting holes for Q-D swivels are placed around the front and rear to allow ‘Giles Sling’ or any other sling to be installed. Anodized black. A replacement barrel nut is included. This is the complete system. It consists of the standard T.A.W.S. 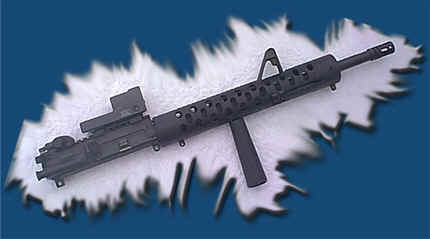 handguard, that is then tied to the upper receiver by a full length Weaver rail. This rail either covers the original flattop or creates a new one and extends to the front of the handguard, it also contains flip up metallic sights. Now its ready for most any sighting system you want. These are made to directly replace the round composite handguards that come on the factory AR-10 and SR-25’s. They are machined from 1/8” wall 6061-T-6 aluminum tubing. A 3/8” slot is milled in the bottom for a handstop, vertical grip and a bipod. They offer the same features as the AR-15 models. These are put together with the same parts that are used on the match uppers. Sight bases not included, the barrels are shorter, the upper hasn’t been modified and TAWS handguards are used. The Sure-Fire light and removable handles are not included. They do include the vertical grip, light mount, and 3 swivel studs.